SAN FRANCISCO (AP) -- Tim Lincecum's days of dominance may be in the past. That doesn't mean he can't dial up flashes of the Freak he once was - especially against the San Diego Padres. Lincecum pitched his second no-hitter against the Padres in less than a year, allowing only one runner Wednesday and leading the San Francisco Giants to a 4-0 win. ''Today I tried to be a little bit more efficient and take what they were going to give me. They were giving me a lot of groundballs and a lot of pop flies, so I was just going to try to keep attacking the way that I was,'' he said. Lincecum totally shut down the weakest-hitting team in the majors, striking out six and walking one in a 113-pitch outing - 35 fewer than he needed last July 13 against the Padres in his first no-hitter. Lincecum retired the final 23 batters after walking Chase Headley in the second inning, relying much more on his off-speed stuff than his fastball. Though the Padres hit a few balls hard, San Francisco fielders didn't need to make any exceptional plays to preserve Lincecum's gem. The right-hander with two NL Cy Young Awards became just the second pitcher in major league history to twice no-hit the same team. Hall of Famer Addie Joss did it for Cleveland against the Chicago White Sox with a perfect game in 1908 and a no-hitter in 1910. Lincecum (6-5) threw the 16th no-hitter in Giants' team history. Just one other pitcher has thrown two - Christy Mathewson for the New York Giants more than 100 years ago. In fact, Lincecum joined Sandy Koufax, Randy Johnson and Roy Halladay as the only pitchers with two Cy Young awards and two no-hitters. ''Just to be in that company allows me a chance to pat myself on the back a little bit,'' he said. Making the performance even sweeter was the fact that Lincecum even got two hits of his own, becoming the first pitcher with two hits in a no-hitter since Rick Wise hit two homers for Philadelphia against Cincinnati on June 23, 1971. But Lincecum will always be known for his pitching. He arrived as a shaggy-haired phenom nicknamed the Freak in 2007 for his ability to generate tremendous velocity from his slight frame. He won NL Cy Young awards in 2008 and '09 and helped lead the Giants to their first World Series title in San Francisco the following season. As age and wear and tear ate away at his velocity, Lincecum was forced to change what kind of pitcher he is. It hasn't been an easy transformation at times as he posted a losing record the past two seasons as his ERA hovered around 5.00. He was even relegated to the bullpen when the Giants won it all again in 2012 but was brought back with a $35 million, two-year deal last offseason for moments just like this. Headley walked with one out in the second after falling behind 1-2 in the count. The Padres began the day worst in the majors in batting average, runs and hits. This was the third no-hitter in the majors this year. Clayton Kershaw did it exactly a week ago and his Los Angeles Dodgers teammate Josh Beckett did it earlier in the season. The Padres, incidentally, are the only franchise in the big leagues that has never pitched a no-hitter. Lincecum made quick work of the San Diego hitters in the late innings. He drew a standing ovation when he batted in the eighth, then got another ovation when he took the mound to begin the ninth. Lincecum struck out pinch-hitter Chris Denorfia to open the ninth. Pinch-hitter Yasmani Grandal followed with a tapper back to Lincecum, who tossed to first for the out. Will Venable was up next, and Lincecum retired him on an easy grounder to second base. Lincecum took a few steps toward first when the ball was hit, stopped to watch the play and clapped his hand into his glove when it was over. 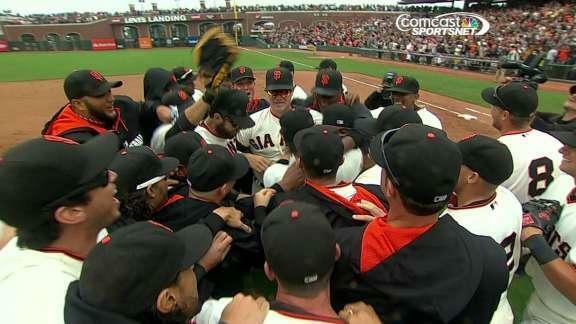 Catcher Hector Sanchez soon met Lincecum for an embrace, and the rest of the Giants joined in the celebration. Buster Posey got four hits, including a double, and drove in two runs. Ian Kennedy (5-9) allowed four runs on nine hits over 6 1/3 innings. He walked one and struck out eight. The Giants took a 1-0 lead in the second when Brandon Crawford tripled and Sanchez hit a sacrifice fly. NOTES: Giants RHP Ryan Vogelsong (5-3, 4.13) is scheduled to start Thursday's series opener against Cincinnati. ... RHP Tyson Ross (6-7, 3.22) starts for the Padres against Arizona on Friday. ... The Padres are hosting a public memorial for Tony Gwynn on Thursday at 7:19 p.m. at Petco Park. Gwynn wore No. 19.